Llandudno is one of my favourite holiday resorts. Llandudno full of George Formby members, entertaining large crowds of holiday-makers over a three day period, is something else again! 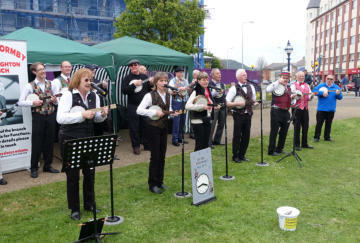 That is what occurred over the 2017 May bank-holiday period when Llandudno staged a Victorian Extravaganza and the Westhoughton branch of The George Formby Society, together with a few friends, gathered together to play and entertain in nine 45 minute sessions over the three-day holiday period. This made the whole Victorian Extravaganza a really pleasurable experience for the many visitors to the popular seaside resort. 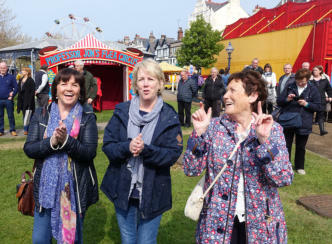 Dennis and Debbie Lee are the two people who have worked for the last twelve months to organise the Formby event and their efforts were well rewarded by appreciative crowds who generously donated monies to support the Llandudno event which is now in its 31st year. There is nothing nicer then to see total strangers smiling and laughing at Formby’s cheeky lyrics, and even dancing whilst the group gave their best in interpreting many of George’s most popular hits. The format for the shows is a real winner, four microphones for the four people most familiar with the current song, backed up by the rest of the gang. This ensured that on each and every number satisfaction was guaranteed – and for all players it was so rewarding to play and be a part of such a great team. The weather was kind as well with not a drop of rain to trouble all those calfskin vellums! Thanks must go to MC’s Dennis Lee, Cathy Darlington, Daz Barry and Alan Newton for keeping the crowd entertained between numbers and making sure we had a captive audience throughout the weekend. A special mention for Gary Hampson who was unable to play but gave sterling service in organising the sound equipment. Also members of the branch did sterling service in walking around the crowds with buckets, inviting anyone to contribute loose change and over £700 was realised towards a future Victorian weekend. 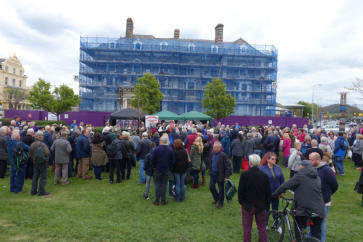 As I wandered around taking photographs, many people said how nice it was to hear the Formby songs once again and even amongst the younger members of the ever-changing audience, they showed their appreciation in great style. 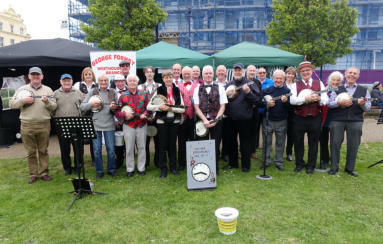 The event was of course Westhoughton’s but we also had GFS members from the Blackpool, Crewe, South Yorkshire, Stourbridge and Liverpool branches as well as members of the Yorkshire Ukulele Circle. Llandudno has been the scene of other memorable Society gatherings. In the 1990’s we successfully held two conventions in the town and these were also organised mainly by Dennis Lee. 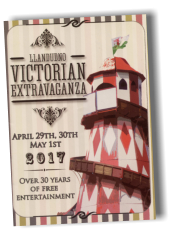 Then the North Wales branch was very active in earlier Victorian Extravaganzas when Cliff Royle and Alison Nadin organised events. A winning team - Westhoughton GFS and friends. 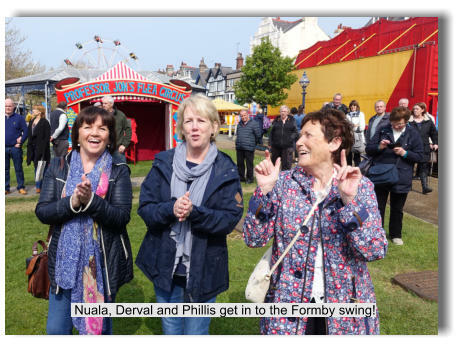 Nuala, Derval and Phillis get in to the Formby swing! Saturday afternoon and Formby is the attraction! Llandudno is one of my favourite holiday resorts. Llandudno full of George Formby members, entertaining large crowds of holiday- makers over a three day period, is something else again! 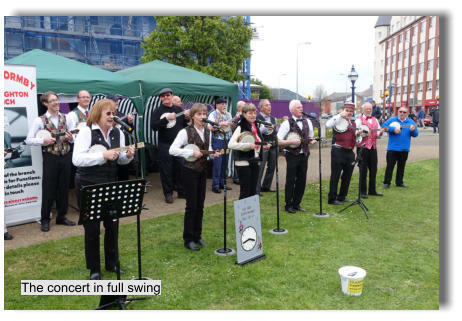 That is what occurred over the 2017 May bank-holiday period when Llandudno staged a Victorian Extravaganza and the Westhoughton branch of The George Formby Society, together with a few friends, gathered together to play and entertain in nine 45 minute sessions over the three-day holiday period. This made the whole Victorian Extravaganza a really pleasurable experience for the many visitors to the popular seaside resort. Dennis and Debbie Lee are the two people who have worked for the last twelve months to organise the Formby event and their efforts were well rewarded by appreciative crowds who generously donated monies to support the Llandudno event which is now in its 31st year. There is nothing nicer then to see total strangers smiling and laughing at Formby’s cheeky lyrics, and even dancing whilst the group gave their best in interpreting many of George’s most popular hits. The format for the shows is a real winner, four microphones for the four people most familiar with the current song, backed up by the rest of the gang. This ensured that on each and every number satisfaction was guaranteed – and for all players it was so rewarding to play and be a part of such a great team. The weather was kind as well with not a drop of rain to trouble all those calfskin vellums! Thanks must go to MC’s Dennis Lee, Cathy Darlington, Daz Barry and Alan Newton for keeping the crowd entertained between numbers and making sure we had a captive audience throughout the weekend. A special mention for Gary Hampson who was unable to play but gave sterling service in organising the sound equipment. Also members of the branch did sterling service in walking around the crowds with buckets, inviting anyone to contribute loose change and over £700 was realised towards a future Victorian weekend. 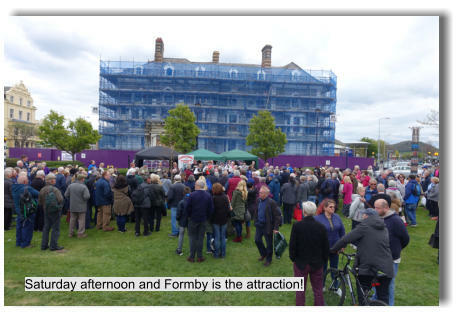 As I wandered around taking photographs, many people said how nice it was to hear the Formby songs once again and even amongst the younger members of the ever- changing audience, they showed their appreciation in great style. 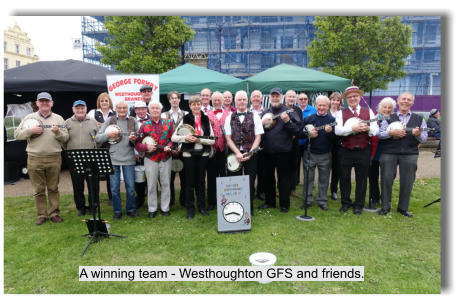 The event was of course Westhoughton’s but we also had GFS members from the Blackpool, Crewe, South Yorkshire, Stourbridge and Liverpool branches as well as members of the Yorkshire Ukulele Circle. Llandudno has been the scene of other memorable Society gatherings. In the 1990’s we successfully held two conventions in the town and these were also organised mainly by Dennis Lee. 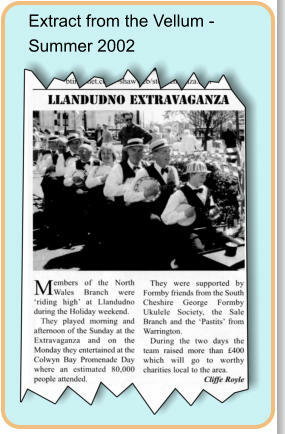 Then the North Wales branch was very active in earlier Victorian Extravaganzas when Cliff Royle and Alison Nadin organised events.